Finding and observing a freshwater turtle's nest could lead to a lifetime of animal study and conservation efforts. Of the approximately 320 turtle species existing in the world, the United States has 57. The Smithsonian National Zoological Park reports that more than a third of the world's freshwater species are threatened with extinction. In 2006, the Convention on International Trade in Endangered Species of Wild Fauna and Flora (CITES) gave the alligator snapping turtle and all species of map turtles, which are native to the United States, international protection. Find natural water sources that you can access, such as streams, rivers or lakes, using a map of your local area. You may have natural water sources in your own backyard. For example, in Houston many little bayous run through neighborhoods. These waterways are teeming with freshwater turtles. Identify the species you are interested in through observation with your binoculars and comparisons with the field guide's entries. Several species of freshwater turtles like to bask in the sun on river banks, partially submerged rocks or logs, or on mid-stream sand bars. Use your notebook to record markings, sizes and behaviors. Check international, federal and state laws and lists to insure the turtles and their habitat are not endangered or protected. A phone call to your local zoo or natural history museum can connect you to a local turtle expert. Observe the turtles at your selected site closely. Most turtles lay their eggs in high, sandy, open spaces during late spring and early summer. You may observe a female digging test holes with her hind feet prior to depositing her eggs. Turtles bury their eggs. An indication of nests could include disturbed sand or vegetation. Since survival of the eggs depends upon concealment, the best way to find a nest is through witnessing the actual egg-laying process. Most turtles leave the nesting area afterwards and do not return. Not all turtles nest close to their home waters. Snapping turtles can travel miles to find a sandy site located near a small stream, to lay their eggs. Observe where baby turtles are coming from. A study done at Indiana University, as reported in 2005 in the Proceedings of the Royal Society: Biological Sciences, suggests that female turtles prefer to return to their birth nest area to lay their own eggs. Observation of the babies may indicate a nesting area. It is illegal to sell or distribute viable turtle eggs. 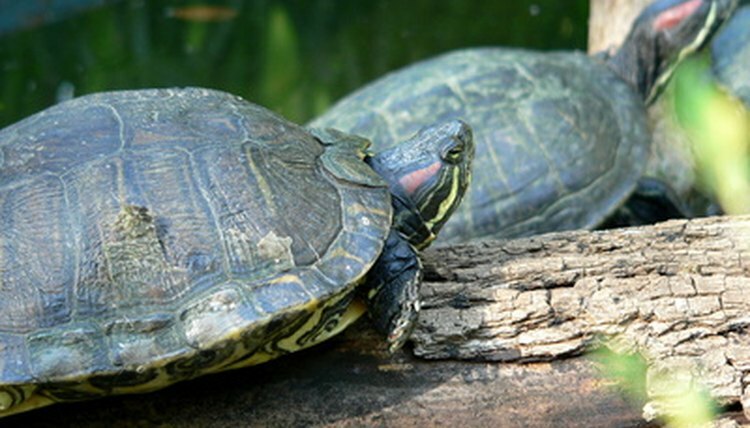 Several species of freshwater turtles are protected by international, federal and United States laws. Use caution when approaching turtle habitats. Some turtles, including snapping turtles, can be dangerous. Be aware of your surroundings and other animals such as snakes or alligators. Michelle DeLaBarre started writing professionally in 1992. She authored and photographed more than 100 articles for the "This Week" section in the "Houston Chronicle," and her work has also appeared in "Equine Images" and the "Rotarian" magazines. DeLaBarre holds a Bachelor of Arts in public administration and legal services from the University of Central Florida.